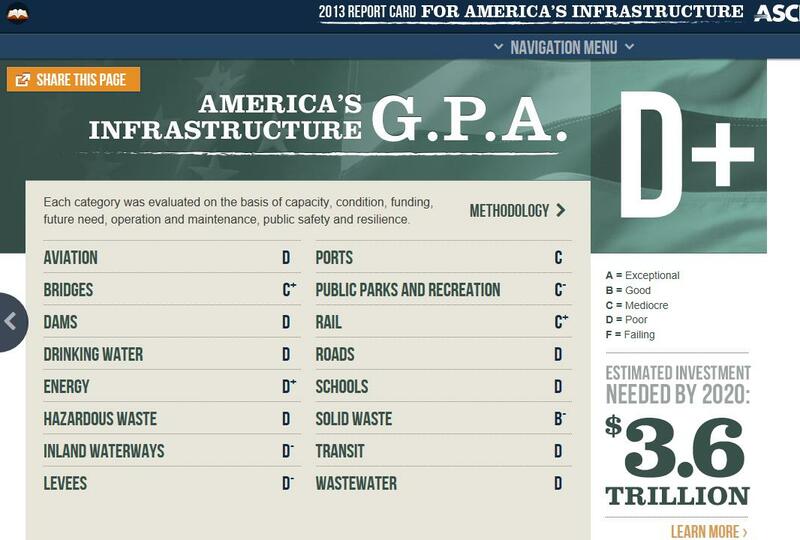 The American Society of Civil Engineers released their 2013 Infrastructure Report Card today and the grades aren’t very good. But wait, I thought the 2009 Stimulus with all the shovel ready jobs was supposed to improve things and create jobs. Nope. I’m a big fan of limited Government but building roads, bridges, levies, etc. is something that falls within the scope of our Federal and State governments and is money well spent because it benefits the whole of society. But after a wasteful spending of almost $800 billion in 2009 we are still faced with crumbling infrastructure that must be fixed. I think I have an idea how to fix our Infrastructure problem, lower our unemployment rate and get some people off our ballooning Entitlement programs. Instead of borrowing money for these infrastructure projects (like we did in 2009) and conducting these projects in the usual inefficient governmental way, let’s turn more control over to private companies and incentivize people who are on Welfare and Unemployment Insurance (UI) to work these construction jobs. Give the engineers in the government programs like the Department of Transportation more power to select private contractors, prioritize jobs and execute them without the normal bureaucracy overreach. Divert money from Welfare and UI to private contractors so they can use those funds to hire people who are able bodied but trapped in these Entitlement programs. Companies can be connected with local Welfare/UI offices and they’ll get Federal and State funds once they hire people from these programs. No extra government spending will be required and many able bodied people who want to get a job can now get a job, pay taxes and stimulate the economy. Unemployment goes down, a portion of the Entitlement spending programs goes to put people to work and private contractors get a portion of their workforce paid by Federal and State money (higher profit margins for the private contractors). The people on Welfare/UI were getting paid to sit at home anyway so why not use that money to put some of them to work rebuilding our infrastructure and give them real job experience that they can parlay for future work once the construction projects are completed? Of course this sounds too easy and makes too much sense to ever get implemented. “Common Sense Government” is definitely an oxymoron…….